Cybermetrics: Did The Yankees Buy A World Championship In 2009? Did The Yankees Buy A World Championship In 2009? That was the subject of a recent Wall Street Journal article by economist Andrew Zimbalist titled The Yankees Didn't Buy the World Series. On the surface, it would seem that they did. They ususally have the highest payroll and they signed three big free agents in the off season, 1B man Mark Teixeira and pitchers C. C. Sabathia & A. J. Burnett. Teixeira led the American League in home runs and runs batted in while the two pitchers both finished in the top 20 in earned run average and the top 11 in innings pitched. "It's a little surprising, but the statistical relationship between a team's winning percentage and its payroll is not very high. When I plot payroll and win percentage on the same graph, the two variables don't always move together. In other words, knowing a team's payroll does not enable one to know a team's win percentage. 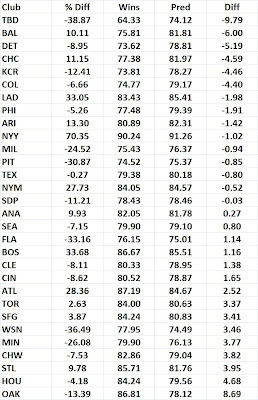 More precisely, depending on the year, I find somewhere between 15% and 30% of the variance in team win percentage can be explained by the variance in team payroll. 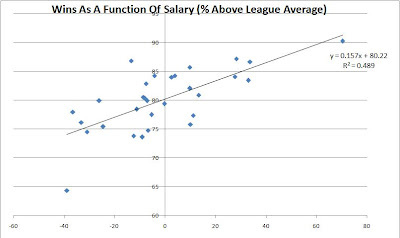 That means between 70% and 85% of a team's on-field success is explained by factors other than payroll. Those factors can include front office smarts, good team chemistry, player health, effective drafting and player development, intelligent trades, a manager's in-game decision-making, luck, and more." Some readers, however, disagreed, making some good points in the letters to the editor a few days later (see In Baseball’s World Series, Money Loads the Bases). The best point may have been made by Ira H. Malis who mentioned that the top 4 teams in salaries in the American League make up, on average, 60% of the teams that make the playoffs. Economist T. Norman Van Cott makes a good point in support of Zimbalist, that long before the period of free agency, when players can sell their services to the highest bidder (with certain limits), the Yankees dominated baseball. But we need to recall that before 1965, a player coming out of high school or college could sign a contract with any team (but then the reserve clause kept them tied to that team forever). The Yankees had money advantage over the other teams in getting good players in the first place. They could offer bigger bonuses and the promise of often getting a World Series check and making business connections in New York. Zimbalist also only analyzed the salary and win relationship one year at a time. I did something different last year, using team averages over many years. I found a stronger relationship between salaries and wins that Zimbalist did, that almost 50% of variance in team win percentage can be explained by the variance in team payroll Here is that post (Another look at salaries and wins).